Humayon's Tomb [and gateway], Delhi. 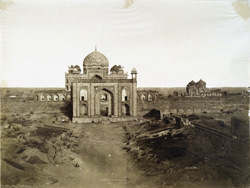 bl.uk > Online Gallery Home	> Online exhibitions	> Asia, Pacific and Africa Collections	> Humayon's Tomb [and gateway], Delhi. Photograph of a gateway leading to Humayun's tomb in Delhi from 'Murray Collection: Views in Delhi, Cawnpore, Allahabad and Benares' taken by Dr. John Murray in 1858 after the Uprising of 1857. The tomb of the Mughal Emperor Humayun (r. 1530-56) was constructed c.1565 by his widow Haji Begum. The architectural style incorporated Persian and Mughal styles which later influenced the building of the Taj Mahal in Agra with similar features including a central bayed arch, a raised dome, and the use of chatris or pavilions. The tomb is located within a char bagh, a four-fold garden. "Based on the char bagh types established in Iran and more fully developed in Babur's own concept of the ideal garden, such formalized and geometrically planned garden settings became standard for all the imperial Mughal mausolea." Visible in this picture is the gateway with Humayun's tomb directly behind and central dome seen above. The two buildings on the right are the Barber's Tomb (c.1590) and the Blue Dome tomb (c.1556-1600).